We take pride in the time-honored traditions and strict standards of equine competition. There are no shortcuts, only with hard work and discipline can a horse become a great hunter jumper. Years of equine and horse show experience between the management, staff and trainers make this facility the best in the area! Our professional staff are experts in hunter and jumper competitions and training. As a member of Little Raven Ranch, you and your horse can enjoy all of our wonderful amenities including: a 175,000 sq. ft. outdoor arena, a heated indoor arena, 24/7 security, custom feed programs, and much more! Little Raven Ranch is a premier equestrian facility. Little Raven ranch is dedicated to making your horses time with us the best it can be! 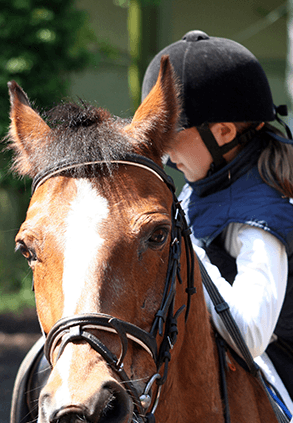 We have a commitment you and your horse to keep you happy. We are a Hunter/ Jumper facility offering multiple boarding options, lessons, training, clinics, shows, trail access and a convenient location. We strive to create an atmosphere that is beneficial to the horses well-being, as well as our clients standards of professionalism and friendliness. View our schedule for upcoming training, events, and shows HERE. Fill out this short form and a member of our Little Raven Ranch staff will get back to you soon. We have two trainers who operate their programs out of Little Raven Ranch; Karen Stone with Stone Ranch, and Erin Bownds with Chimney Creek Farm. Specializing in hunter/jumpers, they can tailor their training packages specifically to you and your horses needs.